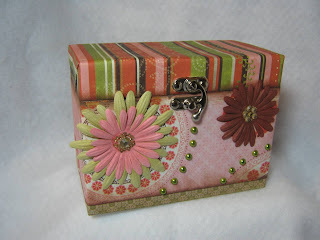 Okieladybug's Scrap N' More: Do ya expect me to do a giveaway?? The Diva Va Voom's are over. I have made no more so why are you here? What? You expect me to give them away?? *okie sighs deeply and rolls her eyes* WELL FINE THEN! I will give away a set of my Diva Va Voom cards!! Sheesh you guys drive a hard bargain! *okie falls out of chair laughin*. Okay I will be honest. Once I started making the cards and everyone seemed to really like them I planned then to give away a set. But you know me I can't just send a set of cards, I gotta make a nice little box for them to go in!! So yep, if you are the lucky winner you will get 12 different Diva Va Voom cards that are seen in this picture, one of each I made and a nice little box for them to go in and can be reused after you send all the cards! As you can see the cards fit neatly in the box so you can refill it when you need to! The box is one of the recipe boxes I got at Michael's last week and I covered it and decorated a bit. So to enter for this giveaway you will have to be come a follower, sign up for email subscription to my blog, post this giveaway on 287 different messageboards, donate 2 gallons of blood, walk on hot coals and post links to everything you did to prove you did it! *okie bangs head on desk laughing and gives herself a concussion* TOTALLY KIDDIN!! You guys know me better than that! Seriously, all you need to do is leave a comment on this post before midnight central time on Friday, August 13th *okie hopes that isn't a bad omen*. I will use the random number generator to pick a winner on Saturday, August 14th. AND PLEASE ENTER ONLY ONCE! Comments have to be approved so it might take a bit before your comment is posted. I just celebrated my one year blog-aversary! Come over and enter in my drawing for TWO gift cards! I love your blog Okie!! I so love these cards. I check your blog everyday. Love your sense of humor. Can't wait to see what your next project is. Wow - your cards are gorgeous, but the box is even cooler! So much talent... thanks for your constant inspiration and humor! I'm already a follower, I signed up for your email subscription I posted this giveaway on 287 different messageboards, I donated 2 gallons of blood, I walked on hot coals and I posted links to everything I did to prove that I did it!!!!! 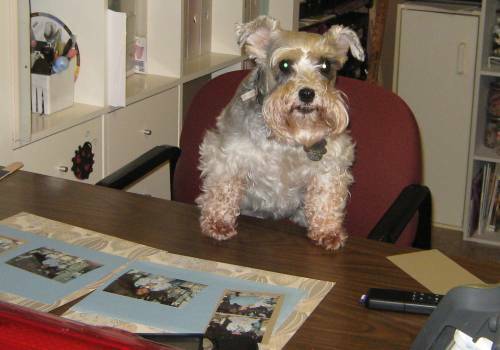 I would do just about ANYTHING to win a set of handmade cards by the infamous Okie!!!!!! i love the accrodian card holder. they are realy cool!! I think these cards are awesome, please, please pick me! I read your post every morning. Hearing about where you go and shop makes me more homesick than ever. Thanks for the personalization of your blog and the instructions. Love the cards! Thank you for the chance to win! And thank you for making me laugh!!! OMG...who doesn't want a box of free cards!!! I know I do!!! Thank you for sharing. Love your diva cards! Hope I am picked. Those cards are wonderful and that box is so pretty. Thanks for the chance to win! Oh my gosh! You are so funny Okie! I was just about to find my nearest blood donation center! I love looking at your cards, you do an amazing job! Thanks you for the chance to win your Diva cards, they are great! Ok you are so freaking funny,well I'm feeling a little week from giving 2 gallons of blood but I made it back here to post to 287 other blogs, so now I'm leaving my comment, great cards and i love the box. How cool would it be to win an Okie original. VERY COOL! Thanks for the chance to win these wonderful cards Okie! I am so glad I do not have to give blood or walk on hot coals! Wow! Who knew you could do so much with a box from Michael's? Looks amazing. Wow I'm the first one to leave a comment. Okie you are too funny. I really love your cards they are sooo beautiful. Love the little box also adorable. All I can say is WOW!! What a fantastic giveaway - I love these cards! and great minds must think alike 'cause I got one of these recipe boxes at Michaels to alter for something too! I'd better go back and get a few more! Thanks for sharing! These cards are adorable!! I LOVE the little box, what a neat idea! Thanks for sharing! Would so love to win some of your awesome cards! I'm a follower and I shared your website to a friend about a week ago to show off your cards...not sure about those hot coals, LOL! OMG these are so adorable!!! I really love the way you altered the box also I'm thinking I need to pick up a few of the boxes and alter some for gifts this coming Christmas!!!! Thank you for sharing. YIPPEE! Love the cards, and LOVE the box too! You know I'm a follower - I just forget to check with you all the time, unless I see you post something new on facebook. so I'm so glad you have email subscriptions now! Cause I NEED more crap in my email! LOL! ROFL! I'd love to watch you try counting the 287 postings, lol! wow this is great i love your diva cards so much!!!!! Your cards are great.,...love the box decorations...and thanks for always making us laugh! Love The Diva's (the red-headed ones look like me!)Thanks! How sweet of you to part with a set of these wonderful cards and the beautiful box too. A very lucky person who will win this gift! Hope I get lucky! Your cards are so fun. I would love to have a set of them. I get great ideas from your blog. I'm glad you are in the circle. Love it! Your cards are way cool and the box is a must have! As always, Thanks for the giggles Okie! 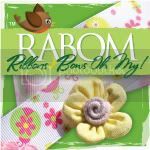 Ooh....a chance to win some Okie creations! Yay! Love ya! Too funny! You know a lot of your readers (myself included) would do all of that for a set of your divas... I would have to draw the line on walking on the hot coals.. I'm a wimp. you crack me up....I love the cards and I love the sweet box that you shared. GREAT BLOG CANDY!!! Handmade Okie cards!! Wow a person just has to sign up for that opportunity! OOOOOOOOOOOOOOOOOOH random number generator pick me pick me. Okie I LOVE these cards and thank you for your generosity! I would love to have some of your cards, thanks for the opportunity to win! Thanks so much, this is very generous of you! I love these cards, I have been enjoying seeing them as you've posted them on the Circle message board! I love all of your posts-they make me smile. I feel like I know you. Would love to own a card you made. refill the box? that would mean I would have to give away the cards - they are too nice for that! Awesome giveaway, thanks for the chance to win. Love the diva cards, they are awesome and I would love to win them. Girl not only are you super hilarious but totally creative AND generous too! Thanks for the awesome give away but more importantly for sharing your creations and humor with us! I hope you recover from your concussion soon so we don't have to wait too long to see what you make next! Oh Okie, I have been watching these since your started making them and wondering what the heck is Okie doing with all those cards...I thought maybe Etsy...which you really should do...you have talent. Well thanks for a chance to win. Oh Okie! I LOVE your Diva Va Voom cards and appreciate the chance to win them! This is my first post on your blog which I have *shelly stalks like a maniac* followed and adored for a few months. Your "falling from the chair laughin" makes my day EVERY time!! As ususal, your blog made me laugh! You are truly a funny person. The cards are adorable. I would love to know about the box. Is it in the "dollar" section? Okie-you are so sweet! I would love to win these!!! does hot concrete substitute for hot coals?? ?i follow you every post and have downloaded a few cutfiles that i used this week! still to post my finished projects but quite honestly i keep coming back for the laughter!!!! thank you! From one Okie to another-I love these cards and know they would cool me off during these hot hot days of summer. I Love your inspiration and ideas. What a great giveaway. I love the little box. Thanks so much. You're cards are so professional! I love the matching box to go with it! Thanks for the chance to win! Okie, You are so funny! I always laugh when I am reading your blog. Thanks for the giveaway. I would love to see your handiwork in person. I would love to be gifted the lovely cards! I love these fat little ladies. They always seem to say what I'm thinking! SO... Pick me Pick me!!! OMG!! I hope I win. Your cards and box are beautiful! Thanks for the chance to win. Wow! Talk about creating a professional looking product! These look so beautifully presented in that gorgeous box. Thanks for the chance to win. These cards are awesome!! So kind of you to give a set away!! Thank you for the chance to win! I love your cards, and the box! Thank you for a chance to win, Okie! Wow! TOO COOL! I have been watching your Diva cards every day! Honestly...I loved the cards so much I hadn't even thought that you might give them away! I hope you made a set for yourself! Very generous...and I'm not even rollin' on the floor laughin'! I'm a stalker, oops! I mean follower... I love your cards, the box, and most of all your sense of humor. Thanks for a chance to win! These cards are beautiful. You do awesome work. Okay, I WANT these cards! LOL! And if the random generator picks my post I pinky swear that it was not rigged in any way! Okie, These are so adorable. I love them. Thanks for sharing your wonderful creations for all of us to enjoy...I have been inspired by you and your talents. OMGosh, I can't believe you are giving me a set of these awesome cards!! And in a beautiful box as well! Well, I would have donated blood and anything else you said just to have a chance at these cards!! I just love them!!! Thanks for the chance to win these divas!! Super fun giveaway!! Love all your work! Honestly, I do not usually sign up for give aways, but my boss (an awesome woman!) would die for this set of cards!!!! She loves the unusual and fun... (Thought - maybe that is why she hired me??). So, yes, oh yes! I would love to win. I was wondering when you started churning out all these sets if there were going to be goodies in the future! So glad you decided to share! I almost missed this, someone is going to be very lucky! Okie, your humor always brings a smile! Your cards do, too. I would love a chance to win the card set, and good luck to the lucky winner! BethAnn M. OMG!!!! I so wanna win! Love all your cards! These are super cute!! You crack me up! Love that box. Thanks for the chance to win! love the cards and container. Thanks for the chance to win. This is my chance! I love your cards and want to learn from you! If I win, I'll get the chance to study your work! I so love all of these cards! Thanks for the chance to win. Those Diva cars are co cool! Thank for the chance to win them! And I love your sense of humor...don't ever give that away! These are so damn cute, thanks for a chance to win. My only problem is I drank to much last night, so can't give that much blood, lol. Wow Okie! Are you feelin ok? Nah.... Wow that is a really great prize especially because we know how much work you put into them. I would LOVE to have a set of your cards! Thank you so much for the chance! Okie, you crack me up. I love reading your blog and your cards are THA BOMB! You are so funny! Your cards and box are adorable. Love your blog! and your sense of humor!!! !Thanks for sharing your awesome cards! Okie, your cards are awesome. Thank you for posting your contest on the Circle board. I check your blog so often I thought I was already a follower, but now I definitely am. Love your stuff. Thank you for this opportunity to win! These are fabulous and it would be an honor to have them! That box is sooo cute! I also love the cards! Thanks for the chance to win. Girl I gave myself a concussion trying to read the rules!!! Cheryl is hoping that Okie will come to the SWARM in Norman on the 21st so she can meet the original Okie in person!!! Thanks for the chance to win a set of your cards. You really make nice cards. I visit your site frequently to see your new things. OMG, I've been loving your cards and would be thrilled to win. Great box to boot! Thanks for the fun. Wow!! This is so generous of you to give away all those cards you spent so much time on! Thanx! You're a HOOT!! Oh okie you are too too funny - only 2 gallons of blood? I have been a follower for awhile and must say you do make my day. Oh boy. I would love to win those cutey cards. THanks for making them. What great cards and the box is just darling, thanks so much for the chance to win. OMGoodness.. great job on these cards.. I would love to win them! HAHAHAHA!!! My children think I'm crazy because I'm seriously laughing so hard!!!!! These are such beautiful cards, anyone would be lucky to win (and WOW what a beautiful box)!!!!! Thanks for a chance!!!! i've seen your cards on the Cricle MB and love them. You (continuously) crack me up! Thanks for the chance to win. I love these ladies too! Would love to win this GREAT give-a-way. Okie, you really outdid yourself. I love the card and the box to go with them is adorable. Great work as always. I love following your blog because I get a kick out of your humor and candidness. Those cards are so cool and that box is a keeper. Thanks for the opportunity to win. I would love to win some Okie memorabilia!! Love your stuff and you're humor! Those cards are so stinkin' cute I've just got to put my name in the pot! Oooh . . . . Pick Me. I love your Diva Cards!! And I have followed ALL of your requirements to the letter!!! I promise! Thanks for sharing. Okie, you always make me laugh! Hey, thanks for posting on facebook in the pm. Those cards look amazing!! Great job on the box! and cards of course! I would love to be the recipient of these beauties! Love your blog. I'm on the road on my birthday (3rd time in 5 years - bad employer, bad employer) and you made me smile, which I really needed. Thanks for brightening my day. I have been following you for months now (ok, I've been stalking you). I love reading your blog and seeing your latest creations. You are so talented and generous. I hope I win because these cards are way cool! Your initial restrictions were great. It seems like you were on target for what people ask for with their give a ways. Made me laugh out load. Thanks! 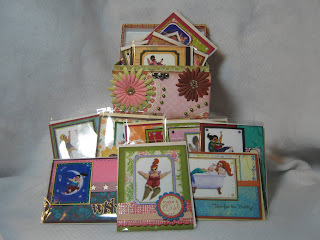 Love the Diva cards, the box, your blog, and your wonderful sense of humor! Thanks for the chance to win such a fabulous giveaway! OMG, what a great giveaway!! I love the diva cards. You did such a nice job on them and I loved the video tutorial too. Okie you are the best! You are my daily inspiration. Every morning it is me, my coffee and your blog! I always look forward to your new cards and projects and am so inspired that I try to scrap-lift most of them. Of course, yours are much better! Thanks again for all your creativity and inspiration! ohhhhhh, I would love to win!!! Thanks for the opportunity - YOU ROCK! Okie, I LOVE your posts. You make me giggle everyday :) Thanks for the chance to win these cute cards. Never heard of this line of stamps but they look so cute! Would love to win a set. Thanks for a chace. Okie I love your blog. I wish I was half as talented as you are. I would give my right arm to have some of your work show up at my front door (well, actually I would give my left arm 'cause I need my right arm to write and stuff). Thanks for the chance to win. You are such an inspiration to me. I love to look at all your projects. Someday i hope as good of a crafter as you are. Okie -- you are an absolute HOOT!!! Okie I would love to win your cards! You know you do an amazing job and you are just so darn funny. Thanks for sharing all your hard work with us! Great cards, Great box....and I probably should have read your entire post before I used it as a checklist...I'm weak from the blood letting, I have blisters on my feet from the coals, and carpal tunnel syndrome from all the posting...if I win it will be worth it though! OMGosh I would love to win these cards! Thank you so much for the chance! I have loved them all and I purchased all the Divas you enabler you! LOL! I would have been first to post but I started banging my head against my craft table laughing so hard I passed out. Thanks for the chance to win. note to self: no more head banging! Love the box, its beautiful! Really? Whoa ... you do ask a lot woman!!! Love the Divas. You are so creative. I love all of your work. Cute box also. Thanks for the chance to win the cute box and cards. I love your blog. Your email is the first I check every morning. I also have enjoyed the Diva's! Thanks for the giveaway!. You are too funny! Loe your sense of humor. What I wouldn't give to have that adorable set of cards. Thanks for the chance to win. Sure hope it's me!!! What a great giveaway! I love all your work. Thanks for sharing all with us. I love your blog, creativity, cut files and especially your humor. Keep up the great work. I always come back to see what else you have done! You are my CRICUT HERO! Oh Okie, I love those Diva cards sooo much and would love to win them. They would look so cute framed and hung in my craft room! Thanks for the chance to win! Thanks for the chance to win. I'd love to have something personally crafted by Okie. Love your recipe box, very nice. If I win I will have to put them on my table and just admire them for awhile. You do such great work I will have a hard time using them! If I would happen to win these ( not very likely though) I would not use them I would set them out and just look at them because they were from you.!!!! Mary says to her self, as she is on her knees, please pick me, I want to win so badly!!!!! Thanks Okie for the chance, you're the best!!!! PS can I get extra points if my dad was born in OK? those cards are too fabulous and that box too gorgeous not to want girl! love them! you are one talented gal! hugs! Well first the cards rock as usual and I love the box. Second thanks for posting for me to win kits, keeping fingers crossed! I love your DIVA cards and would love to win the set you have created!!!! Your Diva Cards are devine! You have a great gift and I'm glad you share it with the rest of us! Okie, oh my goodness, you are Hilarious. I really enjoy visiting your blog especially when I am having a challenging day. Hope to win one of your great creations. Love your humor, which we could meet in person. Please enter me for the drawing for your special, lovely, out of sight, awesome, spectacular cards. I love the Diva cards & the box is beautiful! Thanks for the chance to win! 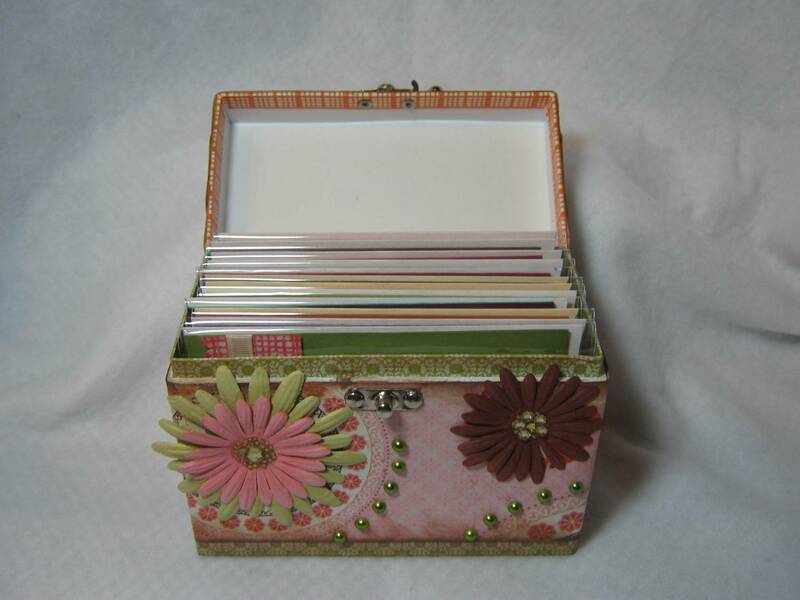 love the cards and i really love the cute box that I will get to keep for myself after I send the great cards!!! Oh my gosh Okie!!! That is way cool and would love to be a winner!!! You have Been such an inspiration for me and appriciate you Very, Very Much!!! It's so much fun to get a peek into your head! You definitely make me laugh every time I read your *thoughts* ... It always seems like it's me talking, the way you do that! If you lived in Ontario I'm sure we'd be friends!!! I fell in love with your Diva Vavoom cards from the first 8) They also remind me of me *grin* Thank you for being so generous with your time and your creativity! I love you all the more for it, and thank you, too, for the opportunity to be selected by the oh-so-fickle random number generator!! Ooh, and btw, in my family, friday the 13th has always ended up being a lucky day! Maybe it will be for me with this draw, too! *wink* Looking forward to all your future creations! Oh My Goodness what an outstanding give away!!!! I have my fingers, toes and legs crossed. NO Okie I don't have to p_ _. I know how you think and I have only been following a month or two. You crack me up! Thanks for that and a chance to win. I love and follow your blog!!! I appreciate the chance to win such an awesome prize from a fabulous lady!!! Great cards! always looking for sassy (cute but not juvenile) cards for my 'seasoned' friends. These are great! Are you kidding me! I love these cards and what a cute box. I have to say whenever I see a picture of Flat Stanley I cannot help but think of you and how you helped your friend trick out and album. You are too generous!! 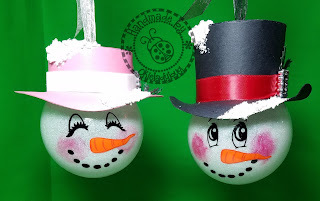 These are Crazy Cute, Love them and all you work, I visit your blog almost every day. This is super sweet of you!!! Love your cards and the box is awesome!!!! I can always be guaranteed a few laughs from you - THANKS!!!! WOW! What a gal! You are too generous to give away one of these sets. They are so stinkin' cute! Thanks for the chance! You're kidding - you're giving away that beautiful box? And it's filled with your awesome cards? I love your Diva Va Voom cards - so perfect for us women over 30...hahaha! ROTFLMAO! Seriously, thank you so much for the chance to win this awesome prize. Thanks for the chance to win this! Thanks and Good luck to everyone! Okie, you are too funny! I would love to win so I can see these in person. I have loved every one you showed on here! Have been following your cards and have really enjoyed them. What a wonderful giveaway! Love the cards and the box. You are a very talented lady! !